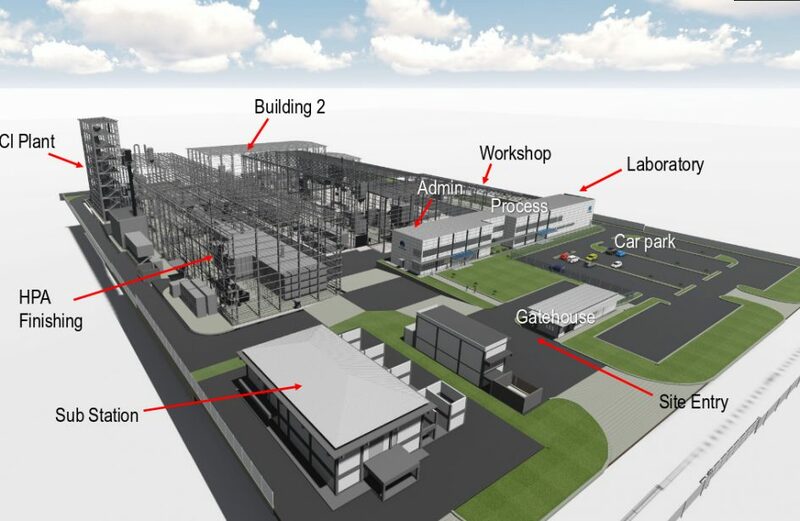 Australian innovator Altech Chemicals Ltd. said yesterday that the firm’s Development Order for its high-purity alumina (HPA) plant in Malaysia has received all necessary approvals from the state, and the establishment works at the plant’s site have begun. Per Altech, activity currently ongoing at the site includes hoarding of the site; establishment of a site office, guard house, and security facilities; construction of access pathways to and within the site; mobilization of the construction plant and related equipment; and signage in and around the site. Altech says work at the site began after the initial approval of a work permit from the local government that went into effect on January 1. Upon completion of site establishment work, Altech will commence stage 1 construction, which includes bulk earthworks, piling the foundation of the maintenance workshop, construction of retaining walls, on-site tanks for water detention (OSD tanks), and the construction of sub-station and maintenance workshop structures. During stage 2, the maintenance workshop built in stage 1 is slated to act as covered storage. According to Altech, the lion’s share of stage 1 construction has been funded and payment tendered to the site’s EPC contractor. Stage 1 expenditures will be credited against the US$280-million lump-sum, fixed-price contract Altech has with the site’s EPC. Altech Chemicals is based in Subiaco, Western Australia and is attempting to implement a marketable process for delivering 99.99% (4N) HPA using conventional equipment at a lower production cost than methods currently available. It plans to construct a 4,500 metric ton per annum HPA plant at Tanjung Langsat Industrial Complex, Johor, Malaysia that will use kaolin clay from a company-owned mine in Meckering, Western Australia. The firm is fast-tracking HPA production due to an agreement with Mitsubishi for 100% of its proposed HPA production for ten years. At present, Altech intends to commence project development later this year.